The Euro started a strong rebound after trading as low as 1.1183 against the US Dollar. A crucial bullish trend line is formed with support at 1.1250 on the 4-hours chart of EUR/USD. The Michigan Consumer Sentiment Index in April (Prelim) declined from 98.4 to 96.9. The NY Empire State Manufacturing Index in April 2019 might increase from 3.7 to 6.0. Earlier this month, the Euro traded towards the 1.1180 level before starting a strong rebound against the US Dollar. 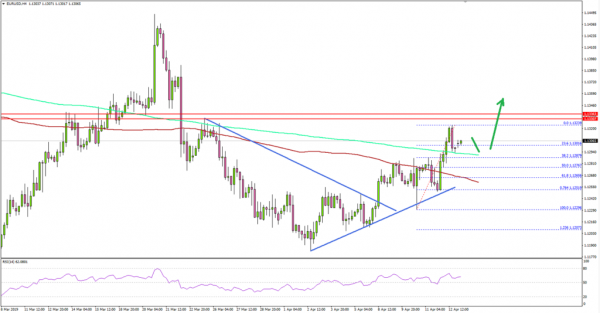 The EUR/USD pair broke the 1.1220 and 1.1250 resistance levels to move into a positive zone. Looking at the 4-hours chart, the pair even broke the 1.1265 and 1.1280 resistance levels. An intermediate swing low was formed at 1.1229 and later the pair settled above the 100 simple moving average (4-hours, red). Finally, the price traded above the 1.1300 level before running into the 1.1320-1.1340 resistance area. Recently, it corrected lower below the 23.6% Fib retracement level of the last wave from the 1.1229 low to 1.1323 high. On the downside, there are many supports near the 1.1275 and 1.1265 levels. The 50% Fib retracement level of the last wave from the 1.1229 low to 1.1323 high is also near 1.1276 to act as a support. More importantly, there is a crucial bullish trend line is formed with support at 1.1250 on the 4-hours chart of EUR/USD. Therefore, the pair remains supported on dips near the trend line and the 100 SMA. Fundamentally, the Michigan Consumer Sentiment Index (Prelim) for April 2019 was released by the University of Michigan. The market was looking for a minor decline in the index from 98.4 to 98.0. The actual result was lower than the forecast, as the Michigan Consumer Sentiment Index is expected to decline to 96.9 in April 2019. Looking at the index of consumer, there could be a decline from 88.8 to 85.8. Overall, EUR/USD is showing positive signs and it could make an attempt to climb above 1.1340 as long as the 1.1250 support is intact. Swiss PPI for March 2019 (MoM) – Forecast +0.3%, versus +0.2% previous. NY Empire State Manufacturing Index April 2019 – Forecast 6.0, versus 3.7 previous.